Today Clara brought in some beautiful peacock feathers to look at. She found them at Staglands when she was visiting there. Our shared big book this week is all about a peacock getting a job on the farm. Today we observed the peacock feathers ( looked closely) and then we wrote about the feathers. Here we are looking closely with the magnifying glasses. Thanks Clara for bringing along your special feathers. 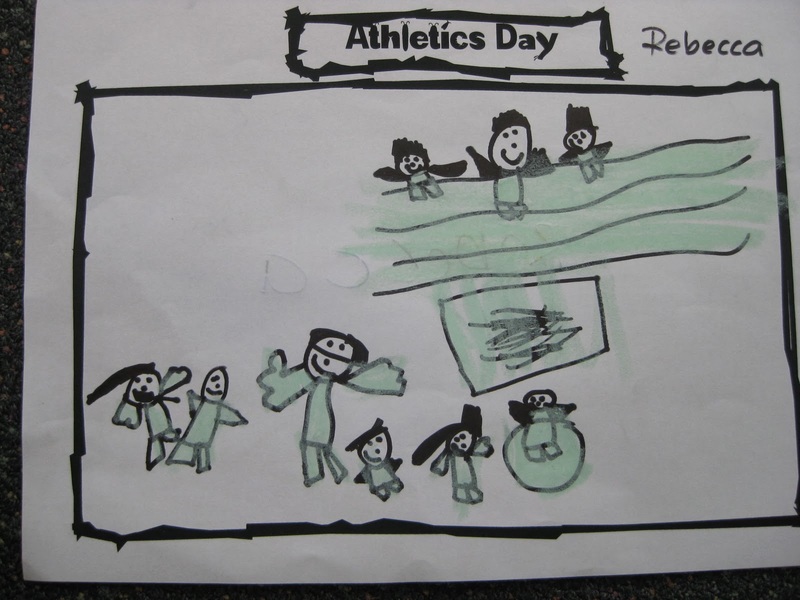 Athletics Day - Rebecca's Story. 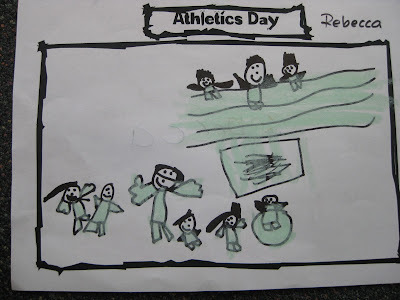 I went to Massey for Athletics Day. I was so clever at high jump and I jumped over the bar. 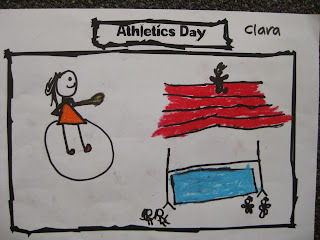 My favourite part was long jump because I thought it was extremely exciting to jump in the sandpit! What an amazing day up at the Massey Athletics Track. The weather held out with only a few 'showers', enough for us to get to do all of our activities! The children loved having a go at all the events. It was so great to see such perseverance and positive attitudes all round. There was a good show of whakawhanaungatanga,(positive relationships), with lots of cheering on, support and friendship. A big thank you to our lovely Bright Bug parents/grandparents who came to help and/or support us. As always, we couldn't do it without you. Photos of the day to follow soon, but here are just a few pictures so far of the children's favourite event/s of the day. We have been learning and thinking about our value for this term - Having positive relationships (whakawhanangatanga). This week we write some stories about what we think makes a good friend. Atta - "Jaylen is a good friend because he helps people and cares." Elliot - "Dad is a good friend because he hugs me"
Rebecca- " Riya is my best friend because she always plays with me. She always plays the games that I play. She gives mehugs and plays with me a lot. We go play on the playground." Heidi- "Mikaela is a good friend because she plays with me and she is caring when I fall over." Clara - "Maddie is a good friend because she came to my birthday." Aaliah- "I like Heidi because she helps me and she does the right thing to me." Chloe- "Emma is a good friend because she likes playing hide and seek with me. She cares about me. She and I roll on the ground. She makes me laugh." Angus- " Nelson is a good friend because he makes me laugh. He helps me if I'm hurt. he plays with me and he is caring to other people." Jaylen- "Connor is my best friend because he lets me play with him everyday." Sam- "Basil is my friend because everyday Basil plays with me." Daniela- "Rona is a good friend because she lets me go on the i-pad. She is so fun to play with. She helps me when I am hurt." Rona- "Spencer is an awesome friend to me because he makes me laugh and lets me play with his lego too. I love playing with the lego." Mikaela- "Heidi is a good friend because she cares for me and she plays with me at playtime. She loves me and I love her too. She is really beautiful." Bailey- "Harry is a kind friend because I like him. He plays with me. He makes me laugh." Keira- " Heidi and Mikaela are good friends because I always play with them. Sometimes I lose them but then I go and find them." Chelsea- "Rebecca is a good friend because she came to my party." Nelson- "Alex is a good friend because he went to my pre-school. He is a good friend." Riya- " Rebecca is a good friend and Chloe too. They are good friends. They are very kind to me." Wow Bright Bugs, you are such good friends to each other. You love playing together and I love the way you care for each other and help each other out. It is so great to see you thinking about what helps us have positive relationships - whakawhanangatanga! Tino pai rawa! Wow, we have been doing some fantastic independent learning in the Bright Bugs. During reading time one of our independent activities is to write fast words on the whiteboards. Another activity is to create something at the 'Making Table' that begins with our blend of the week using the lego. You can see Nelson's cool 'ship' and a car that 'shoots'! We have also been working really hard on being independent after lunch, showing kawenga - (responsibility) by coming in and reading a book from the library corner. What a super job Bright Bugs. Josharn has also written a super story with Whaea Lorraine this week on the whiteboard, listening for the sounds he can hear in the words. Our writing this week was all about positive relationships (whakawhanaungatanga) - What makes a good friend?'. We had to think of a friend and then give reasons about the things they do that make them a good friend. Josharn wrote "Riya is a good friend because she likes me." Wow, we were sooooo amazing at assembly on Friday. If you couldn't make it or just want to have another look, then view below. Congratulations to Mum and Dad and to you Chloe on becoming a big sister. You will be such a great, caring sister to Grace. We look forward to her visits! 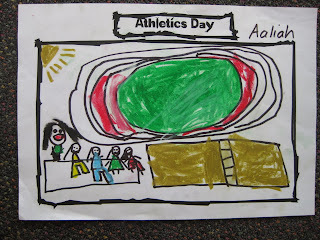 Atta: I like athletics. It is fun. 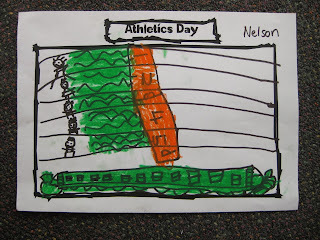 I learnt to run fast (sprints) Elliot: I want to go to athletics because I want to get stronger. 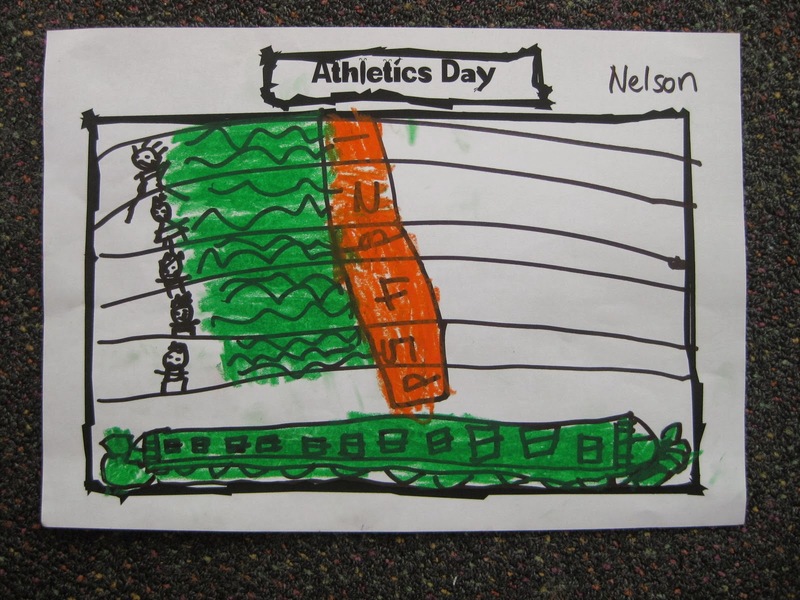 Nelson: I do athletics. I have won one trophy because I won a race. Me and Bryn had a tie - we came first at the same time. Rebecca: I enjoyed the 'pancake' throw - discus! Angus: I have been doing maths games on the i-pad. Josharn: When I was in the playground I had no one to play but then I went and played with Jaylen and Elliot. Aaliah: I played with Quiana and her friend. Daniela: I let some people play with me. Mikaela: I saw Chelsea alone so I asked her to play with Heidi and I. Atta: I let Rona play with me. In writing we have been learning to put in our full stops, remember our finger spaces and using the stretch machine. Some of us have been adding detail to our writing. Nelson and Jaylen did some great independent learning during maths time today, matching up the written numbers with the correct number of objects in each group. They then took their own photos as evidence of their learning. Ka pai boys! We had a great time learning with the Wise Owls during Discovery Time last week. Jo came in and helped us make our own recycled paper and we had to show responsibility in many different ways, inside and outside with our buddies. Here is a little photo movie of our Discovery Time. Last week we had the word family '_at' and we came up with heaps of words. e.g. bat, cat, fat, hat, mat and Matt, pat or Pat, rat, sat, vat and even Atta's name has 'at' in it! This week our word family is '_an'. e.g. can, fan... Can you think of some more and make a comment on our blog? Here is Elliot with the special book we won for our class for the 'Dress Up Your Door' Competition. Thank you to The Hub! Go the Bright Bugs. We dressed up our door with some very gorgeous art based around the book 'Meg and Mog' - one of our favourites! We made pictures of Meg the witch and Mog the cat and Elliot even made a potion! We also wrote some amazing stories about the book. It is now on our wall display so do come and view! Oh - and we won the junior section so our class was gifted a book called 'The Clifford Collection'. Clifford is a fabulous BIG red dog! We are enjoying reading that at the moment! Hoorah for the Bright Bugs! We had to think of lots of words that started with the letter 'v' and that had the letter 'v' in them. We are learning to draw at least 5 pictures. We have to draw the outline shape of the picture first with felt pen and then colour inside the shapes with coloured pencil. Look at these fantastic pictures! We are learning to be scientists and are learning some very important scientific skills. In our 'Science of Art' theme we have been using chalk and pastel and dye in our art work and have been learning about the similarities and differences of these art materials. We had to make a prediction about what we thought might happen when we put the dye over the pastel flower and the chalk flower. We had to observe what we could see happening and then we had to share our ideas. We then compared the things that were the same and different between the two pictures after we had put the dye on. After that we had to discuss why we thought the chalk flower disappeared / faded whereas the pastel flower stayed strong and bright on the page. Amazing learning with our Room 2 and 4 science buddies! Look at our little movie of our chalk/pastel and dye pictures and see if you can work out what happened!! Over the past week we have been making salty dragons for our science of art. We had to make predictions about what would happen when we dyed our dragons and put rock salt on them. We had to observe what happened. These are our salty dragons. Don't they look fabulous! During maths we have been learning about shapes. We are learning the names of many 2D shapes and how many sides and how many corners the different shapes have. I wonder if you can remember some shape names and tell your family how many sides and corners each shape has. You could go on a shape hunt at home and find lots of different shapes together. We are also going to be learning the names of some 3D shapes and what they look like. That sounds interesting! We have been having fun with our student teacher, Dani, using paint and glue to make finger-painted bugs. This is step one. Our next step is to make a background using collage (sticking lots of different bits and pieces on the paper) and then we are going to cut our bugs out and stick them onto the background. I wonder what they will look like when they are finished? Magnificent I bet! What an amazing stage show today of 'The Big Sad Wolf'. It was incredibly funny. We were still chuckling away long after the show was finished. Check out the photos! jelly, jam, jar, jet, Josharn, Jaylen, jump, Jack, Joanne, jellybeans, Jupiter... What other 'j' words can you think of? Make a comment and write them down on our blog. The Science of Art - Explore It! Make It! Last week we started our new theme 'Explore it, Make it!. We are going to be looking at the science behind art materials and we are going to be doing some exploring, experimenting and making. It is very exciting! Here is what we did last week with Elly's and Sandi's class. We were learning to predict, observe and share our ideas. What an amazing Hub Launch we had today. Make sure you come in and have a look at the new look. Have a coffee, read a book and relax! We all got dressed up as a favourite book character to celebrate. Don't we look amazing! Welcome to our new Bright Bugs from last week... Aaliah, Chloe and Heidi. We love having you with us in the Bright Bugs and can already see that you are fantastic learners. A big warm welcome to our new Teacher Trainee, Dani. It is great to have you with us for the next 4 weeks. Enjoy our movie and make a comment if you get a moment! On Friday we had sharing time. Elliot brought his volcano along to school that his brother Ash made for him for his birthday. He showed us how it worked - very cool Elliot! We had quite a bit of discussion about what we could see happening. I wonder why the volcano 'exploded' like that when you mixed the vinegar in with the baking soda? Chelsea brought a special book from home to show us, Sam brought his basketball along and Clara showed us the cereal she bought at school this morning made by Rooms 3,6 and 5. I bet that will taste yummy! Nelson shared Brynn's rugby cards,Angus showed us a lovely butterfly that he had been given as a gift and Josharn showed us a super cute photograph of himself when he was just 3 weeks old! Jaylen brought his special spiderman comic books to share and Rona brought along a super home-made book that Nanny Marj had made. There were lovely nursery rhymes with photographs showing the characters in the nursery rhymes that she had taken at a park on a recent visit to Australia. We knew quite a few of the nursery rhymes! Keira told us she was looking forward to staying at her nanas and Rebecca showed us her plasticene snake that she had made at home which had lots of bright colours in it. Mikaela finished off our sharing time after returning from her dancing exam and she showed us a few of her dance moves and we joined in. What a super dancer you are Mikaela! Have a look at our little movie of our sharing time. Check this out! The Bright Bugs performing at the Regent last Tuesday night. What a fabulous dance - you were outstanding Bright Bugs! Great sounds Nelson and Rona!!! What an amazing time we had at our Junior School Cross Country today. It was freezing cold but we ran so fast we didn't even notice! 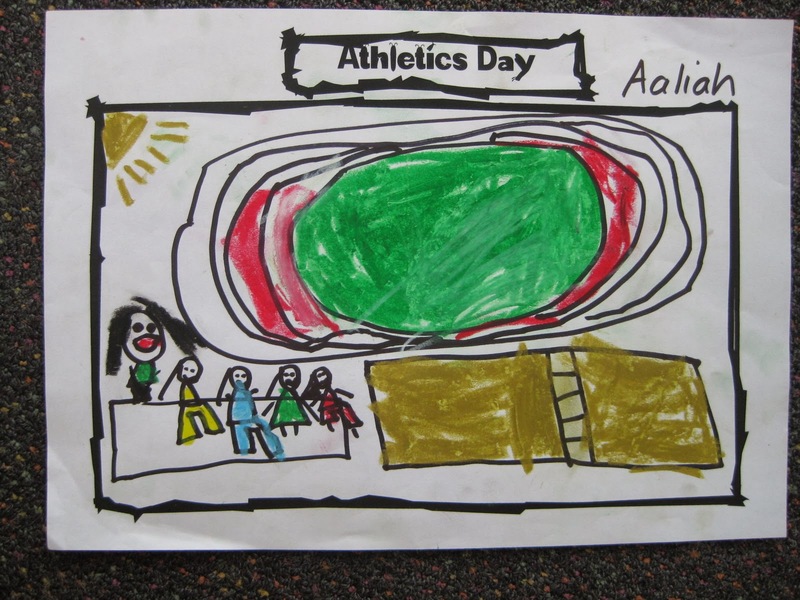 Fantastic effort from all the Year 1 and 2 children, who showed a great sense of Kotahitanga by supporting their friends and cheering them on. We all had lots of fun too! Every Friday, Tohora, The Bright Bugs and The iBots get together for singing. ; Here we are singing "5 Little Buns"
Our letter of the week is the letter H. We thought of lots of words that begin with the letter 'h'. I wonder if you can think of some more and pop them onto our blog comments. On Friday all of the RSS children and teachers were involved in the Jazz Big Apple Crunch along with thousands of other NZ children and adults. We broke the world record for the most people crunching an apple at the same time! Very impressive! We all donated a gold coin to contribute to raising money for 'KidsCan', an organisation that helps less fortunate NZ children. A super effort, all for a good cause and fantastic fun too! On Friday we have sharing time. It is an opportunity for The Bright Bugs to bring something special from home to share with the class or they can talk about something that is happening or a coming event. Here is a little video of our sharing time last Friday. We have 2 letters this week - C and K. We came up with lots of words that begin with the 'c'/'k' sound. Here are some of the things we thought of. cat, cake, candle, curtain, cushion, caterpillar, cabbage, capsicum... Chelsea starts with the letter C too! Can you think of some more? Post them on our blog. A big welcome to Angus and Keira who started on Monday. You have made a fabulous start to school and it is wonderful to have you join us in the Bright Bugs! What a magnificent smile Angus! Super ball skills during Catch Me If You Can Keira! Today the maths mission of one of the groups was to order numbers using the 'Counting Buses'. We had to make the pattern of numbers in order, counting forwards. Most of the buses had a number on them so we had to include that number correctly in our counting pattern. If there was no number on the bus we could make up our own counting pattern. To show Nicole what we had done, we had to take a photo of each bus that we did. Super counting and ordering of the numbers Bright Bugs! Gorgeous marae pictures by Riya, Mikaela and Rebecca, our visit from Daniela and Angus today and reading after lunch in the library corner on Friday. Great sharing and helping going on! The girls wanted to show off their insect necklaces that they made when the letter 'i' was our letter of the week and there is some great maths learning going on! We have been learning to add and subtract numbers up to five. And then there were 6! Welcome to the Bright Bugs, Chelsea. It is so nice having you here with us. We love your big happy smile! You are a big 5 year old now! This is a lovely picture of you on your first day of school with Mum. During reading time we were doing lots of 'e' activities as this is our letter of the week. Look at our great letter e's that we made with the play dough! A big bright welcome to Nelson who joined the Bright Bugs on Friday. We love having you in Room 10 Nelson. Look at how you can write your name! Look at the amazing photos and little snapshot videos that we recorded during our time at the Marae. A big thank you to Sonita who put all our photos together to make this cool movie. We look forward to reading your comments on our blog! What an amazing day we had! The bus trip was exciting, especially as for most of the Bright Bugs it was their first time on a bus and their very first time on a school trip! The Marae experience was outstanding. What a fabulous opportunity for all the children, teachers and parents. Thank you to our wonderful team of teachers and supportive, encouraging and helpful parents that made the day such a success. Tini pai rawa! We took part in many cultural activities starting with a powhiri welcome by Rooms 12 and 14. It was very moving and special for us. They welcomed us onto the Marae as Manuhiri (visitors) and then we became the Tangata Whenua (people who belong). The children were involved in Te Rakau (stick games), Poi, Harakeke weaving (flax weaving), Haka, Sketching of the Wharenui and an art activity inside the wharenui which involved looking at the beautiful kowhaiwhai patterns. Whew - it was a busy, fantastic experience and I am sure the memories of this day will last the children for many years to come. Last week The Bright Bugs, The Wise Owls and eNine all got together to practise our hongi for the powhiri at the Marae. We talked about how it is a greeting and a special Maori traditional custom. It is a sign of respect to hongi as a greeting on the Marae. We were amazing, especially as for many of us it was our first time doing this. Last week we recorded ourselves saying our poem of the week and doing the actions. Didn't we do well? Today we made Easter Baskets with our buddies in the Wise Owls. We had a little balloon and inside it there were two Easter eggs. We had to wrap the balloon with wool that we had 'drenched' in a 50/50 mix of PVA and water. We have to wait 2 or 3 days until the wool dries onto the balloon and then we can 'POP' the balloon and the delicious Easter eggs will stay inside the wool basket! Very clever. Thank you Adrienne and Lydia for organising this for us. What a lovely Easter treat! Thank you Wise Owls for inviting us to share in your creative Easter activity. Can you touch your head? Can you touch your nose? Can you touch your knees? Mikaela's poem illustration has been chosen this week. She used lots of the space on the page to draw her teddy bear and added detail to the bear. What do you like about Mikaela's teddy bear picture? Mikaela's teddy bear illustration - Wow! Today Room 4, Room 2 and Room 10 had our Swimming Celebration. The children 'showed off' to their parents, grandparents, aunties and uncles some of the swimming skills and confidence building activities that they have been doing over our 6 week swimming programme. Sam says - "I have been getting better at doing a starfish - I kept practising and I can do it!" Mikaela says -" I am trying to get better at blowing bubbles and putting my head under the water. I did well pushing the ball with my chin." Riya says - "I got in the water today and I was standing in the pool." Riya being confident in the water and moving around away from the side. Rebecca pushing the ball with her chin across the pool. Rebecca gliding with the flutterboard. Great skills! Ava and Mikaela floating with the pool noodles. Super floating Mikaela! Sam gliding behind the flutterboard. Awesome Sam! Riya doing a safe entry into the pool using the ladder. Super effort Riya! Wow Bright Bugs - you are certainly growing in confidence and skill in the water! What a bright bunch you are! It was Riya's first day in the Bright Bugs today. A big bright welcome! We are very excited about having Riya in Room 10 with us. There are now 4 children in the Bright Bugs! Today we played a new learning game in maths where we had to make a pair of dinosaur feet by matching a number on one dinosaur foot with the correct number of dots on the other foot. Super counting Bright Bugs! Today we did our first 'Word Power' session. Our word of the week this week is 'is'. Clever Riya with her word power! Rebecca made a big playdough 'is'. What was I learning about today? Mikaela: Today I learnt about some words and I wrote the number 5. Sam: Today I learnt about numbers all the way up to 10 and did some finger patterns and yesterday we counted up to 100. Rebecca: We counted with Mr Hundred's Board. We went to Room 2 this afternoon and joined in with Tohora and Sandi for music. We have been learning about keeping the beat.